The chipmakers provide dedicated System-on-Chip (SoC) solutions for digital cockpits. Some of them are equipped with CAN FD on-chip modules. My first car, an Ami 6 from Citroen, just had very view analog instruments with needles. There was no entertainment at all – except my own voice or those of my passenger fellows. Today’s cockpits feature much more information and functions, including smart phone connections. All this is controlled and managed by highly sophisticated semiconductors. Texas Instruments (TI), for example, has developed a series of SoCs for digital cockpits. Of course, some of them provide already CAN FD connectivity, to get information from the next generation of in-vehicle networks. Besides infotainment systems with 3D navigation and multimedia on high-resolution screens, digital instrument clusters, there will be head-up displays (HUD) overlaying information using augmented reality (AR) to allow drivers to stay focused on the road ahead of them. The audio system plays not only media from the user’s smart phone but remove ambient noise and vibrations coming from the outside of the car. Additionally, rear seats will provide entertainment systems, too. 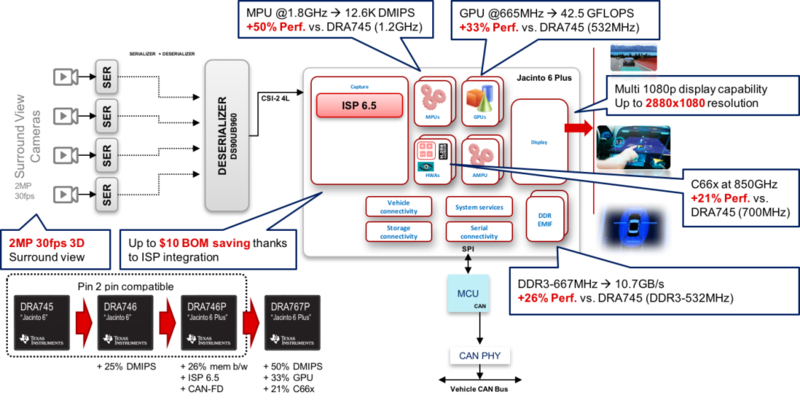 Recently, TI has launched its Jacinto-6-plus SoC. These processors share the same core platform and architecture as the other members of the product family. According to the company, the new family member DRA76xP and DRA77xP provides higher performance to enable customers to add features to help enable a more safe, connected driving experience. This includes a CAN FD on-chip module, CSI-2 ports, and a special image signal processor (ISP). Other interfaces are Ethernet AVB and Most MLB as well as USB. The Jacinto-6-plus comprises a Cortex-A15 core and a dual Cortex-M4 core as well as dedicated 2D and 3D processors. Additionally, the chip provides a digital signal and the already mentioned image signal processor. Those SoCs dedicated for digital cockpits can also be used for other vehicles than passenger cars. Of course, also truckers like to benefit from those products. And there are more vehicle drivers, who may appreciate more entertainment and new functions: Farmers steering tractors, users of construction machinery including excavators and cranes, pleasure boats, etc. Texas Instruments has sold more than 150 million processors dedicated for advanced driver assistance systems (ADAS) and for digital cockpits. More than 35 carmakers are using them. The TDAx family of SoCs is designed for ADAS applications including camera-based front (mono/stereo), rear, surround view and night vision systems, and multi-range radar and sensor fusion systems. These products integrate embedded vision engines (EVEs) and digital signal processors (DSPs) that are optimized to perform complex imaging and signal processing with low-power consumption. The TDA3 is designed for entry-to-mid performance applications including front camera, surround view including 3D without GPU, smart rear camera, radar, camera mirror replacement, driver monitoring and Lidar. The TDA2-Eco is intended for mid-performance targeting 3D surround view connectable to Ethernet or LVDS networks. The TDA2 targeted for mid-to-premium performance for ADAS applications including front camera, surround view with GPU, and sensor-fusion processing. The Jacinto SoC family provides support for a variety of digital cockpit applications including infotainment, head unit co-processing for infotainment, informational ADAS, integrated digital cockpit, digital instrument cluster, head-up display, and more. Designed for automotive safety and robustness, the Jacinto’s heterogeneous architecture includes hardware firewalls, allows separation between HLOS (high-level operating system) and safety OS as well as implementation of robust multi-domain software architecture capable to be Asil-B safety certified. The Jacinto 6 family is built on the same architecture, offering software and hardware compatibility with the broadest array of Cortex-A15 cores.